I know many of you have been waiting for the two page per month dated 2018 calendars, and I’m happy to say they’re here! By far, the two page per month layout is one of my favourite for monthly planning. The extra room in each dated square allows me to add in extra details and makes it easier to quickly check things at a glance. Scroll on down and check them out. Now on to the new ones. Just like previous years I started the monthly grid on the left page. Only having four days per page really helps to create more writing room for each dated box. On the right hand page you’ll find the remaining days of the week as well as a column for notes. The notes column is lined, just like the 2017 monthly calendars, because I got so many requests for a lined notes section. I did try to make the lines a little lighter for those who prefer no lines. I hope I was able to sort of meet the needs of everyone with those. If your printer duplexes (prints double-sided) go to your Print Settings and find the area where you can select which pages you want to print. Set it to 2-24. Then print. Once it’s done, print page one. If your printer doesn’t duplex, go to your Print Settings and find the area where you can select which pages you want to print. Set it to Odd Pages and print. 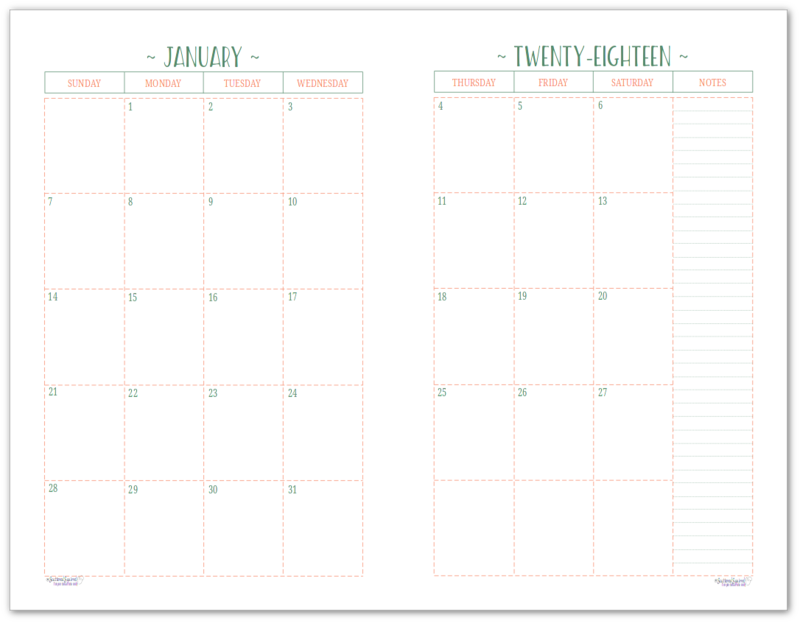 Remove January from the stack and then flip/rotate your pages so that they’ll print on the back. Then go to your Print Settings and select Even Pages and print. This half-size version is set up just like previous years, so it won’t print double-sided. I typically use the back of these pages as notes/scribble pages. They’re great for jotting down reminders for the following month, or even the following year. At the end of the year I flip through and see if I made note of anything we might need to do, like book our eye exams or something. I’m working on a version of the half-size one that is set up to print double-sided for those who would like that option. I ran into a few hiccups when trying to make it work right, but I think I finally got it all figured out. I’m just working on how to simplify the printing and set up instructions. Look for that version to be coming out in a post with a couple other new calendars later on this week! Which calendar layout is your favourite? Do you prefer the full or half-size versions? Or do you like them and use them all for different reasons? Drop me a line in the comments below and share your thoughts. I am so glad I stopped by!!! I have been waiting for these! 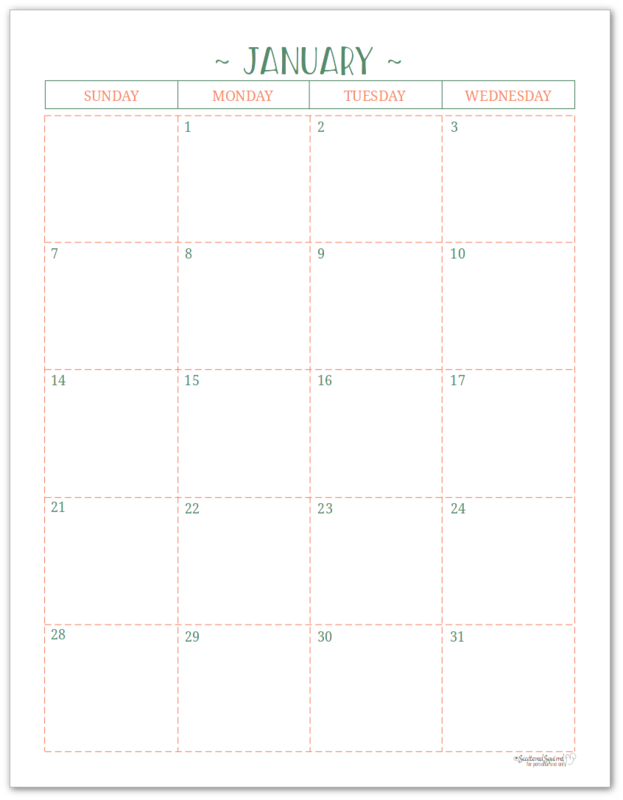 I’m using the monthly overview planners and so many other printables to make my life easier. I already have my 2018 binder started and this was exactly what I needed to pull it all together. Thank you for making them early for those of us who are working for a better next year already! THANK YOU!!! My life is complete for another year. Love the gorgeous calendars! Any chance you’ll be posting a 2 page per month with lines for 2018 like you did for 2017? This gal needs those lines!!! Hi Jody, I’m happy you like them! At this point I don’t have plans to make any, but if I’ll add them to my list and if I can, I’ll do it. Thank you! I prefer the full page 2 page spread. I use them for my “big” calendar which I carry for work and home. Your layout is the best, love the big boxes! Hi Meg, I’m so happy to hear that you like the 2 page spread, it’s a favourite of mine as well. I hope they continue to be useful for you. I love the two page spread you have available! Thank You for your time and effort. I usually buy agenda/calendar, but I have been busy! I already have appointments for 2018, but still using my 2017 agenda. Love the Layout!! These are great. I’ve been looking for an organization system for my high functioning student with ASD, who just entered middle school. All the planners out there are girly, which is great for me but not my boy. We literally drove all over the city in search of a gender neutral 2017-2018 planner with two pages for a month (to plan out big projects) and a large space per day for each class’ assignments (he has large handwriting) with no luck. I love that you went a step further with the homework planner. Thank you! Hi Carol, I feel your struggle. I have two boys too and finding a planner for them is hard. I do have student planners that are more neutral/boy friendly. I’m glad the calendars aren’t too feminine for him. Spectacular, just amazing! I will mention your site to all my teacher co-workers. Thank you for being a planner & having 2018 ready! Actually, as a parent & advisor at our high school, I appreciate having the ability to lay out the whole “school year.” Your 2 page layout is what i love! The printed calendar that I purchase every year has changed their format & I am now a huge SSquirrel fan! I have been working on expanding my planner to include 2018. I am the primary caregiver for my Mother-in-Law and trying to keep up with all of her doctor appointments as well as for my husband and I was a struggle this year. I was using a weekly spread but I think the two page monthly spread will work much better. I am going to use the half page size as it can fit it in my bag with my iPad. I like a two page per month. I like lots of room because I have large writing. I am struggling still trying to figure out the right fit for me. I make lots of lists, take lots of notes, write lots of reminders… I found out last year that I used a plain old regular notebook completely for my notes and printed out a simple but colorful weekly planner to carry around with me. I bought a new notebook this fall (for back to school) and am using the full size monthly calendars taped onto some of the pages. But I’m finding the notebook is just too large and I am going to try getting a cute mini binder and some mini paper. fingers crossed. I love the full size, two page calendar for my Girl Scout binder! Awesome! And thank you so much! I am making a planner layout for a GF for Christmas, would like to add in some color pops that are the same color (maybe some stickers? ), would you mind sharing the photoshop color code so that I can print out matchy-matchy? Also do you mind sharing what program you use to designs these? A few months ago I started using a half-size binder (A5) as my work planner, and your calendar pages work perfectly. 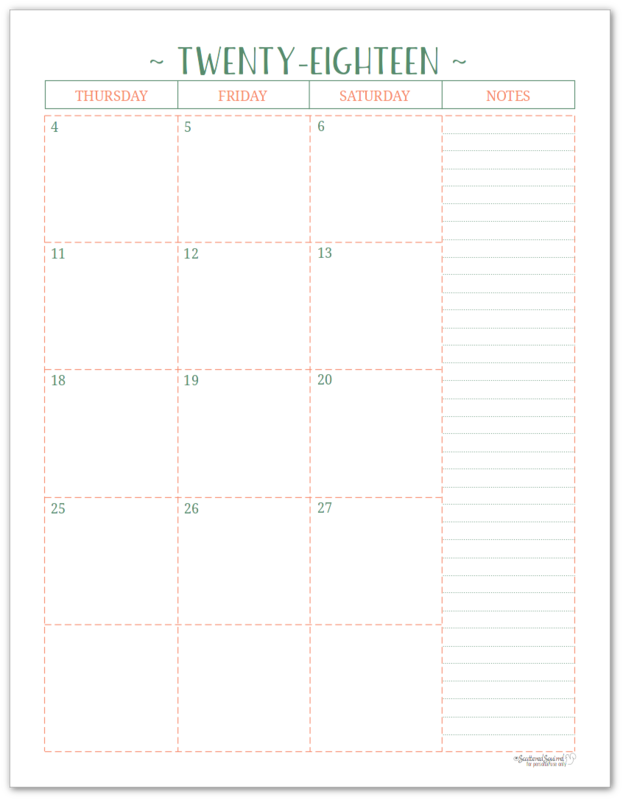 I use the 2-page-per-month calendars printed on cardstock. I love that you have a simple, two page calendar with bigger boxes than most of the commercial planners. I don’t need a daily/weekly planner, because that doesn’t fit how I need to organize and I don’t have tons of daily meetings and appointments to track. I keep track of that stuff online, anyways (so I can get automatic reminders!) I really like having the hard copy for my to-do list type stuff and general note-taking. Thank you for creating and sharing these! Love your work! Beautiful and easy to use! Please continue for years! I love the clean look of the 2018 monthly pages! THANK YOU! For YEARS and YEARS I have struggled to find the perfect calendar for my life. I am a traveling professional with two active teenagers and we have many appointments. I love your printables. I have embraced your idea of making my planner to fit my life instead making my life fit my planner. I have printed multiple pieces to try out and find out what works for me for the year. The only thing I would suggest is adding lines to your double page monthly calendars. Some of us are so OCD we need lines. I love the single page monthly with lines, but I need more room for appointments. Your calendar is exactly what I have been searching for. Thank you for sharing your creation. I’m so happy you like it Vera! I hope you find it helpful. Have the double sided half size monthly calendars been updated somewhere? I’m not seeing them, but I could just be missing them. Thank you so much!! Hi Tracy, no they haven’t. They’re still on my list. I’m trying to find a way to get them to print double sided without having to include complicate print and cutting instructions. I think I finally figured it out, so look for them to be coming out this weekend with some more planner printables that have been updated for 2018. Hi, I really loved using your version last year and was wondering if you could make me a version without the dashed lines. Would be willing to pay. Thank you! I can certainly do that. Send me an email and we can discuss the cost and time frame. Thank you! Thank you! Thank you! This half-sized 2-page monthly calendar is just what I’ve been looking for! Thanks so much for sharing your beautiful work! this is just perfect!!! thank youuu!!!!!!!!!! You’re very welcome. I hope you find it helpful. Why does the calendar say twenty eighteen on it when it is the year two thousand and eighteen? I did it that way because that’s how we say it here in Canada. It’s been ‘Twenty’ since 2010, I’m not sure why it changed. I’ll certainly keep that in mind for future years. I love your designs and your creativity. Thank you for making these free and printable. far off into the future! Hi Kat, thank you so much for your sweet words. I’m thrilled to hear that you like the printables. The 2019 ones are already in the works. Be on the look out for a survey about them coming out in the newsletter and on my social media channels very soon! Anxiously waiting for the half size double-sided calendar!!!! I am a newbie when it comes to organization and your site sure is making it easy!!! Hi Tracy, they are coming. I haven’t forgotten, things have just been really off here for the last few months. I’m hoping to get them out very soon. Thank you so much for your patience. Any prediction as to the release of the 2019 calendars, specifically the 2-page design. I love love love your calendars! Hi Meg, yes I do – end of April beginning of May is when they’re coming out. I’ll be publishing a blog post and sending out a newsletter about them very soon because I’m doing something a little different this year. Love the two page calendars! Cant wait for the 2019 calendars! Cannot wait for 2019 calendars….I use several throughout my house and for my Tupperware business. I love the two page ones for my day planner…I just print them on my favorite paper and have a customized planner like no other!!! Thank you for your time!!! These awesome! As a teacher I use calendars like this daily! I greatly enjoy not having to buy a new calendar. But I do wonder if there is editable 2 page organizer. Its approaching the end of this school year and I’m planning next year. 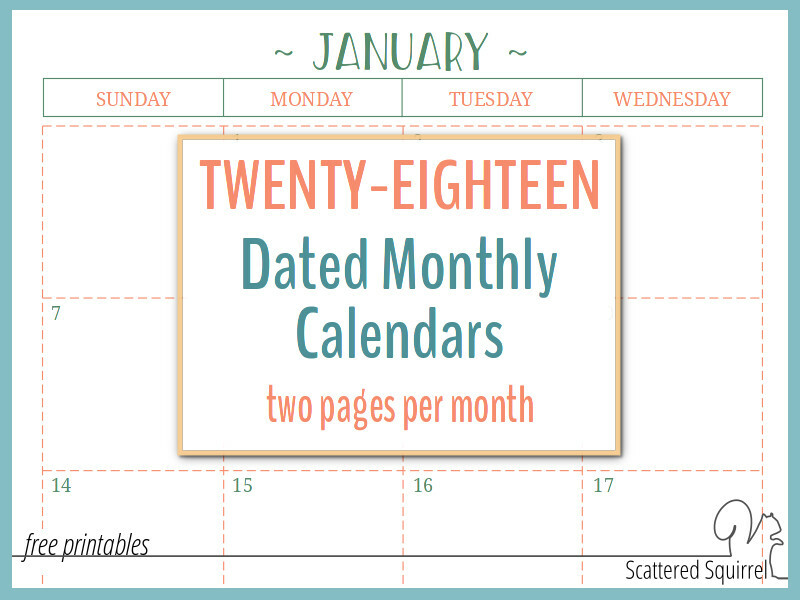 Are you going to have 2019 monthly calendar printables soon? just like this one? Hi, just came across ur site as ur 2-page monthly calendars caught you eye! Was wondering if you had these to fit a “personal size” planner? If possible, please email me at my email address below. Thank you so much! Hi Maria, unfortunately, I don’t have these available in Personal size. The dated calendars usually just come out in half and full size because of how much time they take to make. I’m sorry I couldn’t be more help.